Do you make Encaustic Art? Well...if you didn't before today, we think you might just be taking up a new art form! We at StencilGirl were honored when Enkaustikos and Linda Robertson asked us if we would include the Dragon Flower stencil designed by Pippin Schupbach in their new kit! Not only that! They asked a few of our team to play with the kit to see what they would come up with. We picked people from our team with all different levels of Encaustic experience so that you can see a variety of projects. This kit is JAM PACKED with product not to mention comes with video instruction from Linda Robertson. First up on the hop is Linda Robertson. She will tell you a little more about the kit and show you the video reveal. So, sit back, relax and get inspired! A great big THANK YOU to Linda and Kathryn Bevier from Enkaustikos! 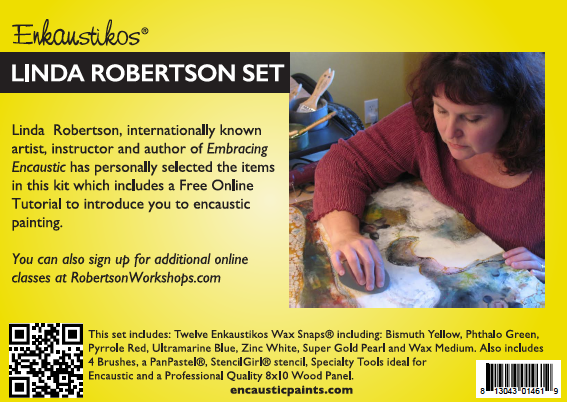 To keep up with all the latest news from Linda Robertson Arts, Enkautikos and StencilGirl remember to sign-up for newsletters and updates on each their sites. 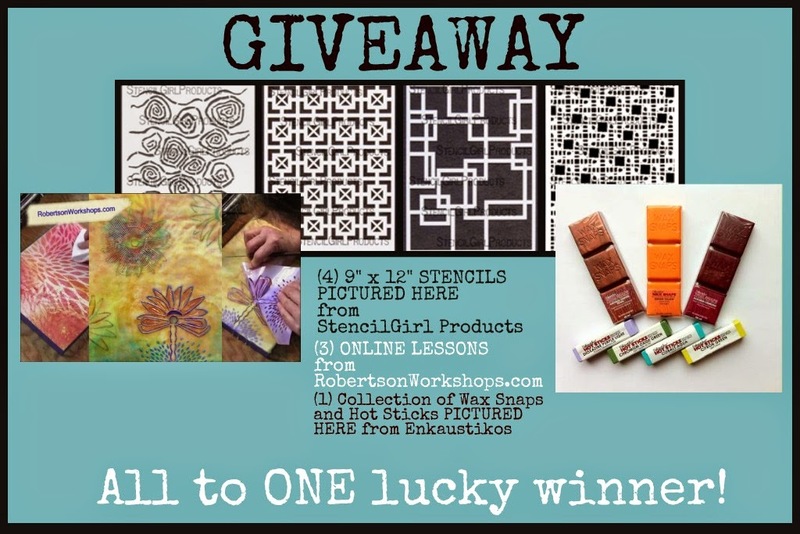 Before you leave....how about a GIVEAWAY from StencilGirl Products, RobertsonWorkshops.com and Enkaustikos? All to ONE lucky winner!! Just leave a comment and tell us if you have ever worked with Encaustic Art and if not, what is stopping you from trying? ALL comments left along the hop trail are eligible for the giveaway. The more blogs you comment on, the more changes you have to WIN! One comment per blog, please. You will have until Sunday, June 8th @ 11:59PM Central Time to leave your comments. **Disclaimer--StencilGirl artists may be using other stencils in their post in addition to or instead of the Dragon Flower stencil that comes in the kit. I have done some encaustics and love it. This is great timing for me... I just bought a set of encaustic wax recently but havent done a thing. I've dabbled using plain bees wax some in the past. It was fun and I wanted to try more so bought the little set, but I needed more instruction so never used it. Off to visit the blog hop for how to's and ideas. Thanks! Fab giveaway - I have sort of tried it in a fashion using a travel iron and wax crayons and that's because to buy all the 'proper' bits, it worked out really expensive so I'd love to have a chance to win this fantastic array of prizes, esp the lessons to get an idea of how to tackle it best. I have tried a little bit with just the colourless encaustics but never with the coloured. Would love a chance to try it out. I appreciate the chance at a giveaway! I have done a faux encaustic using wax crayons and a travel iron. Stopped doing it after seeing more *brown* art then colors. Didn't know how to properly do it?? The only thing stopping me is not having all the supplies. I do have a few and also need some instruction. My heart leapt when I saw the kit full of goodies at the top of this post. I have never used encaustics but I have been fascinated by them for ages. I think I have hesitated using them because I have not known how to melt and use the wax. Never tried this - I'd love to!! I would love to win this give-away. I have played with beeswax and napkins for cardmaking. Piddled w/beeswax on mixed media. Need to learn more. As a great admirer of encaustic art, and someone who loves to experiment with new techniques, I'm being held back by the necessity to buy a whole new range of supplies. What if I can't come to grips with it? Fabulous giveaway! I haven't tried encaustics because I need a good class and some supplies. I've wanted to for some time but have never been sure what to do and never got the supplies. I would like to learn. I never have tried this. I'd love to try. Just not enough hours in the day! The closest I've come to working with encaustic is layering bee's wax over something to seal it in. 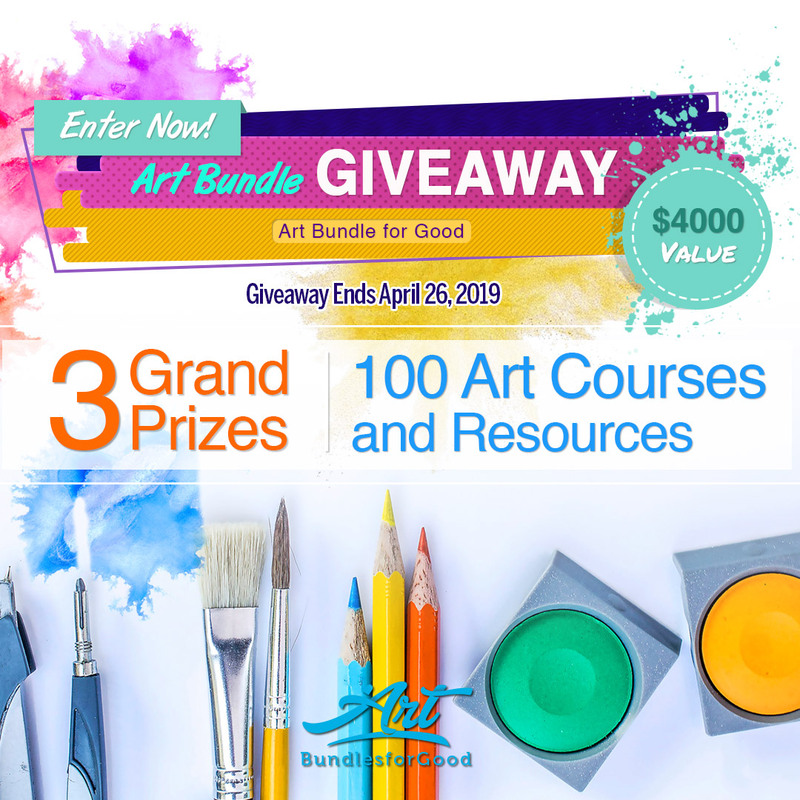 I'd love to try painting with wax and this giveaway is perfect! Thanks for making this possible. What a great giveaway! I've never tried encaustic work - but have always been very intrigued! I'd love to win so I could finally give it a go. I have never tried because this is the first I've heard of it. It sounds like fun and I definitely would like to try! I love encaustics! So different and fun. I don't do as much as I would like because of space, but I do a lot when I go to my friend Tricia's house. That is her main creative technique. Haven't tried it yet but it is fascinating! What keeps me from trying is I don't know how to use it yet. ..those videos would be awesome! I haven't tried encaustics, but I want to, I just haven't invested in the goodies. Every time I see a tutorial or video, I am in awe at its beauty. I can only imagine how lovely the final piece would be in person. I have melted wax crayons with an iron. Does that count? It is liberating in itself. Thanks so much for the inspiration and giveaway. I really would like to give it a try! Thanks for this give-away! I have not tried encaustics beyond beeswax and crayons! I'd like too, and with all this inspiration I'm sure I will….the big reason why I have not is because of the expense and space to set it up. I love the way it looks when finished, and really, you can't get that look with acrylics or anything else that I know of. Thank you for the opportunity to win! All projects are amazing!!! thanks for the ooportunity to win this fantastic prize! the cost for setup has always seemed really high to me. I've painted pages with beeswax to seal them, but having multiple colors and the right tools has always stymied me. Maybe I'll win and get over that stumbling block! I have tried encaustic "collage" and I just took an art class where you encased the finished painting with bee's wax. I would like to learn more about it however. Thanks for the giveaway! I've never used encaustic; I don't really know how. And I didn't know that you can use stencils with encaustic. This looks like something I need to try. I've never done encaustic. I have bought some of our local beeswax with the thought of trying it. I think it will be a project for this summer when school's out. What a wonderful and inspiring blog hop! What a wonderful way to spread encaustic! I love seeing all the different styles and approaches. I've worked a little in encaustic, after collecting a few supplies. What's stopping me from working more, is wanting a bit of instruction on techniques like image transfer, and adding text. Great giveaway! Wow, I have never worked in encaustic...well only to seal canvases in a bookbinding class...so I guess with what we did, it was a start...anyway, I love what I have seen here. So glad to see that you can use a griddle and tins for the different colors of wax...that makes it more accessible. And there were so many interesting techniques with the stencils! Everyone did an awesome job! Thanks for sharing. I haven't worked with Encaustic art because I can't figure out how you may use wax on paper (or in the case of my present project, quilts) and keep the colors permanent. Since my latest project includes fabric, I'm clueless about how a wax medium can remain permanent on fabric. I have wanted to work with encaustics but don't have the set up to start. Thanks for this opportunity! I am obsessed with Encaustics. Omygosh just made it!! I have played with wax but never really knew what I was doing...heehee...Thank you for this generous giveaway!! I have not tried yet but love the look. Winning would get me started.